This flag has been used since 1977. With two horizontal stripes of sky blue and green, this flag features a large white triangle on the left side pointing towards the center. In the center of the triangle is a red, five-pointed star that stands for unity and the five areas in which the Somalis live: the Republic of Somalia, (British Somaliland) Italian Somaliland, French Somaliland, Ogden and northeast Kenya. The color green represents the earth, blue symbolizes the sea and the sky, and white stands for peace and unity. 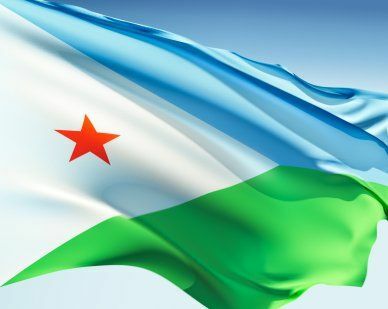 Our top-quality Djibouti flags conform to all official specifications. Emblems and designs are executed with the highest possible degree of accuracy in regard to detail, color shades, placement and proportion to flag size.